Few anglers have the kind of good luck that most of us dream of. Gary is an exception to this, however. 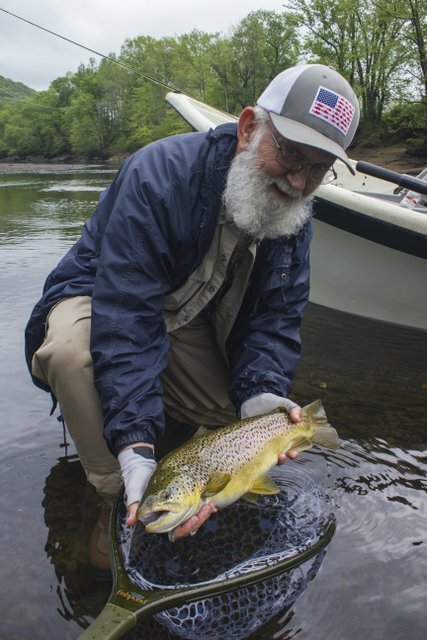 Something good always seems to happen when he comes to float the Caney Fork River. Once, during a guide trip, I accidentally caught a big rainbow trout while demonstrating a cast. The fish should have been his of course. That moment undoubtedly increased his fly fishing karma. He reminds me about this at least once a trip, and rightly so. Of course, it helped that he had already caught a monster brown trout on that same trip. Earlier this spring, Gary joined me for a low water float on the Caney Fork. That low water trip was one of the more epic highlights from the season so far. Little did I know that we had a recipe for disaster lurking on the boat. We pushed off from the boat ramp early in the morning. The river was lower than I have ever seen it. The low water would impede our overall progress downstream, but also open up some structure that we cannot fish effectively on higher flows. I kept pushing us down the river because the generators were scheduled to kick on eventually, and I wanted to be done before then. Several trout had already come to the net including some nice ones. We rounded into the pool where Gary had nailed a big brown trout last fall with high expectations. Surprisingly, we made it the whole way through the pool without seeing any big fish. I still had one spot at the back of the pool I wanted to try, though. This was a spot where I had spotted numerous large trout last summer. If fish were there last year, why not this year as well? One thing that helps Gary as an angler is his casting ability. He dropped the flies exactly where they needed to go and set up a nice drift with a good mend. The current was painfully slow. Eventually, however, the flies drifted into the zone and the indicator dipped. When Gary set the hook, all I saw was a big golden flash and felt immediate panic. There was a lot of structure nearby that would limit our ability to land this trout.The big fish soon made a long run downstream which minimized the hazards associated with the structure. We followed in the boat, slowly gaining back line on what was now obviously a big brown trout. Most battles with trout are over rather quickly, but this trout had other ideas. Several runs later, each one more nerve wracking than the last, we drifted down over a shoal where I beached the drift boat and jumped out with the net. The fish still had some power left, but Gary deftly maneuvered the fish towards the waiting net. We were both ecstatic about this fish. Most anglers would have found a way to lose a fish of this caliber. I waited until the fish was in the net before I casually mentioned that the fish was on the #18 midge and 6x tippet. We took the required hero shots and then watched the beast of a brown trout swim powerfully back upstream to be caught again another day. At 23.5″, this fish set the bar rather high for other anglers in the race for big fish of the year with Trout Zone Anglers. I can’t wait to see someone beat that mark though! To celebrate, we sat down in the boat for a rest, a snack, and a drink. When good things happen, you simply revel in the moment and accept what the river has offered. Asking for more would be greedy. Gary did the only appropriate thing and pulled a…………….BANANA out of his pack. 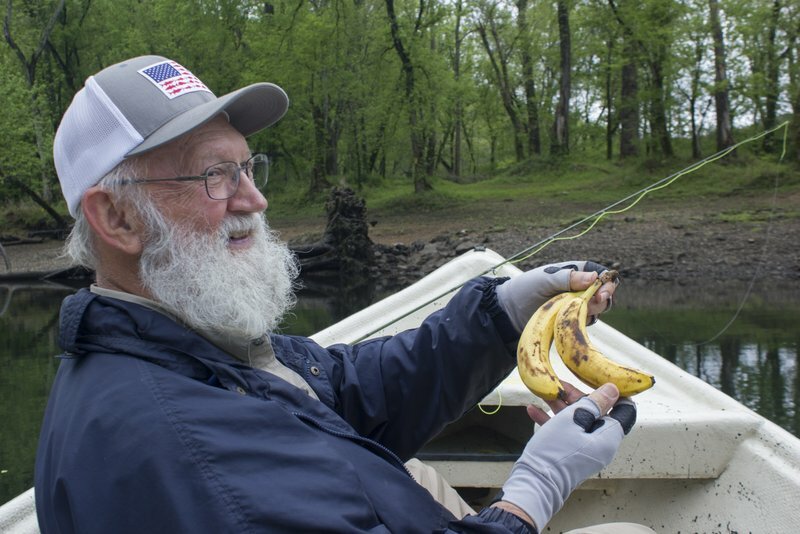 Seriously, this guy’s fish catching prowess is so strong he can defeat the curse of the banana on the boat. Or maybe the boat just has that much good luck. Either way, it was impressive indeed. The rest of the float was rather anticlimactic, although Gary did finish with some great streamer action up near the dam. In addition to several brown trout, we caught white bass and crappie on the fly using streamers. The river is still fishing very well. I have a day or two available in early July, otherwise I’m currently booking the last two weeks in July and into the month of August. This is a good time to lock in your fall fishing trip on the calendar as well.